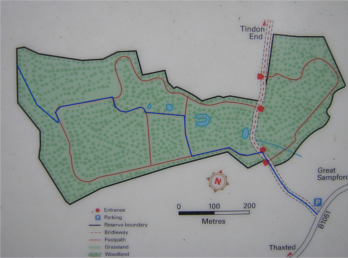 A walk of about four miles to see the Essex Wildlife Trust West Wood nature reserve. OS Explorer Sheet 195. Starting from Margaret Street car park in Thaxted, OS Reference TL612310. 1. Start at the Margaret Street car park in Thaxted. On leaving the car park, turn left along Margaret Street and walk to meet Weaverhead Lane. Turn right and walk to the bottom of the road. Turn left here into Copt Hall Lane. After passing cottages on the left hand side, a field is reached. 2. At the gate turn left into this field and cross it to join a footpath. Turn right onto this path so you are walking with the trees and stream immediately on your left. Near the end of the field the path turns left through the hedge to meet two bridges. Cross the first bridge only and carry straight on to go out into a field. Bear right into the field and after a few metres the path forks. Take the left fork to walk with the field to your right, and at the end of the field follow the path to the right and then take a left hand ‘U’ turn at the end of the ditch and walk towards the hedgerow. Turn right at the hedgerow and follow the path which after the end of the hedgerow continues for 200m between two fields. 3. Continue straight along the path ignoring others that join it to pass the electrical sub-station on the left and then reach a pylon. Keep the pylon to your left and go around it and once you have passed it turn right crossing the field to a bridge over a ditch. Cross this and with the solar panels to your right continue on this path running along the edge of a field by a hedge. At the end of the hedge continue across the next field bearing left to follow the path as it turns towards the road. Follow the path as it goes between two cottages to join the Sampford Road. 4. Taking great care on this busy road, turn right walking along the grass verge for about 100 metres when the entrance and sign to West Wood nature reserve can be seen on the other side of the road. Cross with care. From the small car park beside the B1051, walk down the track towards the wood, and after crossing a small stream you enter the wood. Ignore the entrance on the right-hand side and keep straight on into the hardstanding area. 5. West Wood nature reserve lies on either side of the bridleway here, and has an extensive network of paths to follow. This is a working coppice wood managed on a traditional coppice rotation where trees are felled at intervals from about 10 years or longer to produce a structure of well spaced large trees with smaller younger trees between them, and coppice stools manly of Hazel between those. This rich structure creates great diversity of habitat and benefits a wide range of birds, mammals and insects, as well as providing light when the coppice is felled for the flowering plants of the ground flora to benefit from the increased light levels and then to flower. In Spring the rides have an extensive population of Oxlips, a national rarity but a regional speciality at their best in Mid April. In June they are followed by Common Spotted Orchids and a range of wildflower species that like the chalky clay soils of the wood. The small ponds in the wood are home to Great Crested Newt in Summer, so if you are walking with a dog please keep it out of the ponds. In Autumn the trees provide rich colours, and in mild damp years a range of fungi can be seen. On the left side of the hardstanding area you will see a signboard with the map of the wood, and you enter the wood through the stile beside this sign. Continue on this path until you reach the first junction, with a small wooden shed. In dry weather turn right by the wooden shed. A short distance along this ride you will find a bench if you want to rest for while. This ride, like many others in the wood, has Oxlips flowering in April and Common Spotted Orchids flowering in June. On the east side of this ride is a group of small ponds, which are used by Great Crested Newts in Summer. If you stand quietly by the water and look into the depths you may see some swimming. Just past this pond at the junction turn left. On the north side of the path the block of woodland was coppiced in 2014 and fenced with chestnut paling to keep deer out. The coppice will regrow rapidly providing a renewable supply of wood that can be harvested every 10 to 20 years, and this also benefits a wide range of wildlife, letting the light in so that the flowers that grow on the woodland floor can thrive and flower. But deer love to eat the new shoots of coppiced trees, and will eventually kill the tree, and so have to be fenced out. In summer the ride you are walking along is carpeted with a range of wildflowers. Continue to the next junction beside another Great Crested Newt pond, and turn right, following the path around a curve, and then further on another curve, and leading into a clearing with another seat. This clearing is also very good for Common Spotted Orchid, and also the Twayblade Orchid with its small green flowers. Leave the clearing on its west side, (in effect turning left from the path you came along before it enters the clearing), and follow this path through the coppiced woodland, eventually coming to a T junction of paths where you bear right a little. This next section has not been coppiced for many years, and you will see the contrast with the woodland floor virtually bare of grass or wildflowers because of the shade cast by the mature trees. This path leads to the north-western edge of the wood where a single plank bridge over the boundary ditch leads to a public footpath where you turn right and continue. 6. 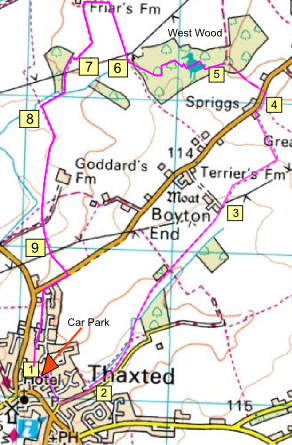 Having left West Wood and turned right onto the footpath, go over another bridge and carry straight towards Friar’s Farm, after about 450m turn left to join the track passing the rear of Friar’s Farm on your right. In around 175m at the rear of Westwood Lodge turn left to join the footpath on the left side of the hedgerow (this path can be very overgrown so you may like to take the grass track on the right side of the hedge as an alternative). 7. After 300m at the end of the hedgerow go through the gap ahead and turn right following the path for 150m, cross the footbridge and turn right for 35m (this stretch of footpath can also be very overgrown so again you may like to take the grass track on the right side of the hedgerow as an alternative) and then turn left to join the footpath. Follow the footpath downhill for 250m with the wood on your right, the path then bears right for a further 175m to join a footpath with a footbridge on your right. 8. Turn left and follow the path for around 250m with the hedgerow on your right, at the end of the field turn right out of the field, then left onto the track, and after a few metres go diagonally right to follow a cross field path for 300m, cross the footbridge and in around 125m there is a choice of three paths, take the middle one across the field for 150m. 9. Cross the farm road and proceed ahead uphill crossing the field to reach a gap in the hedgerow. Climb up the steps and continue forward heading for the hedgerow ahead and to the right which leads to the Sampford Road some 230m away. Cross the road and join the footway in front of the new houses (2015) for 200m passing the entrance to Bellrope Meadow. Turn left to follow the footpath into the recreation ground and head for the exit to the right of the sports pavilion some 275m away. Cross the road (Rochelle Close) and follow the footway to pass Humphrey Lodge on your right and then Vicarage Mead, after 275m turn left down the slope to return to Margaret Street car park, or alternatively join the alley way ahead, cross Margaret Street and walk along Bell Lane to arrive in Watling Street with the Church in front of you and a choice of hostelries both up and down the street.